Dmitry Medvedev About Democracy – Full Video of Speech! This entry was posted in Documentary, VideoBlog of Russian President on September 10, 2010 by admin. We don’t publish speeches and interviews with Russian President Dmitry Medvedev too often. But this one – I think is very important. Russian President Dmitry Medvedev gave an interview for Russian newspaper “Izvestia”. That is a long interview almost 30 minutes video. They brought up different questions mostly about World War II and it was very interesting to hear opinion of such intelligent person as Russian President Dmitry Medvedev. I personally think that the whole interview is worth watching. Izvestia: During Perestroika when the people of the Soviet Union opened its doors to the world, you could feel that civilizations had grown up, the world order had matured and nothing like World War II would ever happen again. But 20 years later, the world is still torn apart by conflict. Do you think there is at least a hypothetic possibility of a military conflict that would be similar to World War II in scale? Dmitry Medvedev: Unfortunately, such a conflict is possible, because there are all sorts of countries on our planet, and they have all sorts of interests. This planet has a huge amount of weapons, and there are people who still consider war as a means for solving their political problems. After all, accidents will happen. So we must be prepared…. You can read the interview on Russia Today. This entry was posted in Documentary, VideoBlog of Russian President on May 7, 2010 by admin. Russian Video: Love Is The Most Important Thing (Dmytry Medvedev)! Regular readers knows that we really like Russian leaders: Dmitry Medvedev and Vladimir Putin and their speeches. And in our blogs (Windows to Russia and Russian Video from Russia) we always try to share them with you. During a special gathering at The University of Pittsburgh, Dmitry Medvedev was asked what is the most important thing. “Love”, – he simply responded. This entry was posted in Documentary, VideoBlog of Russian President on September 25, 2009 by admin. Russian Video: 1st of September -The Day Of Knowledge! All Russians love this day of 1st September! 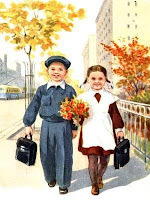 Day the beginning of school lessons, everybody has his own good memories about school and maybe I’ll tell you a big secret but yes, Russians love to study, love to learn something knew, think that to teach kids is very important. This entry was posted in Documentary, Everyday Life, VideoBlog of Russian President on September 1, 2009 by admin. 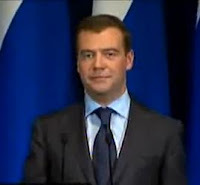 Russian Video: Medvedev's New Year Speech! First of all if you are listening to a Presidential New Year Address you always know exactly when the clock on Spasskay Tower of Moscow Kremlin starts to beat the 12 – and that is very very important because you need to make all your wishes during these twelve strikes and drink Champagne at the last stroke and then you can hope that your New Year wishes become true during the year. This entry was posted in Customs, Documentary, VideoBlog of Russian President on January 1, 2009 by admin. 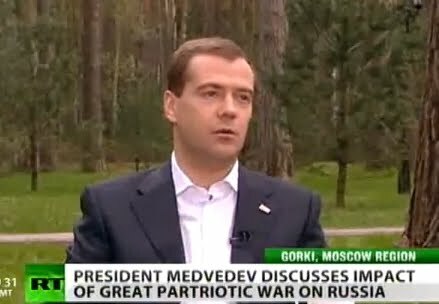 Video: Russian President Dmitry Medvedev about Global Financial Crisis! This entry was posted in Documentary, VideoBlog of Russian President on October 26, 2008 by admin.